HMRC’s Check Employment Status for Tax (CEST) tool was exposed as a root cause of the continuing disruptions which led to hundreds of freelancers facing unjust retrospective tax bills at a Public Accounts Committee (PAC) meeting in Parliament yesterday. Subject to heavy scrutiny over their muddled adoption of the Off-Payroll rules, BBC chiefs repeatedly called CEST and HMRC’s rushed implementation of the public sector reform into question. The BBC confirmed that it is seeking to reach a global settlement with HMRC to provide certainty to roughly 800 individuals who have suffered backdated tax bills, having had their employment status overturned by CEST. “From 2017 onwards, we were surprised by the way the outcomes of the tests that we had been applying perfectly legitimately and properly before were suddenly changed by CEST,” commented BBC director general Lord Hall. During a two-and-a-half hour probing by the PAC, BBC chiefs were asked to recount the broadcaster’s practices regarding employment status in recent years. Though disorganised in its approach, the evidence provided suggested the BBC had engaged in no untoward practices with regards to assessing employment status, with the problems all beginning in 2017 after the introduction of CEST. Lord Hall noted that, in 2013, an employment test developed with Deloitte in liaison with HMRC had determined roughly 900 of 1,000 staff to be self-employed. He added that the radio industry guidelines had always been strictly adhered to in determining the status of the relevant individuals. CEST’s generality and inability to consider sectoral differences. “We’ve used the guidance as we’ve understood it over the years. When we used CEST, people’s employment status suddenly shifted,” said BBC deputy director general Anne Bulford. Bulford later added that the BBC had written to HMRC in 2016, warning that the impending changes were “coming in too quickly and would cause huge difficulty”, yet their concerns were disregarded by the taxman. BBC chiefs were questioned regarding multiple accusations from individuals that they had been coerced into operating via limited companies, or end their engagement altogether, in the years preceding the Off-Payroll rules. Lord Hall conceded that the BBC had left many freelancers with little choice but to work via a limited company. Bulford estimated that the BBC had saved between £2m and £3m per year in employer’s National Insurance (NI) since Off-Payroll was introduced as a result of engaging limited companies and sole traders. Both suggested that the employment status tests conducted prior to CEST had largely vindicated this decision, with the large majority of individuals found to be self-employed. However, Bulford noted that, once CEST was applied to the relevant BBC staff, it determined that roughly 95% were employed. Bulford added that, despite its sharply contrasting results, the BBC had been compelled to use CEST upon its introduction, with HMRC insisting that it would stand by the tool’s outcome. 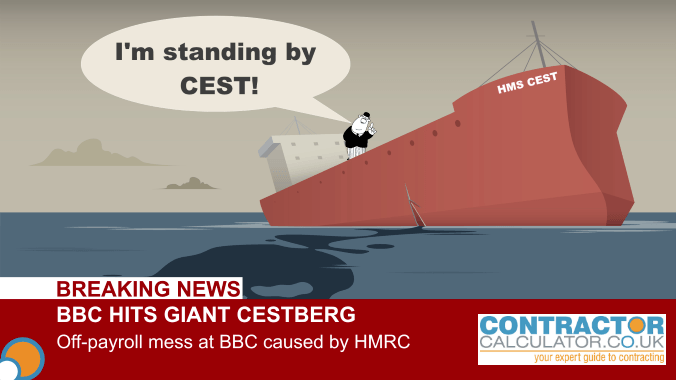 What now for the BBC, HMRC and CEST? Two years on from their implementation, the Off-Payroll rules and CEST remain central to a high profile saga in which hundreds of freelancers face thousands in backdated tax. Having accepted its part to play, the BBC is currently seeking to achieve a global financial settlement with HMRC to prevent the retrospective taxation of the affected staff.